The Secret Sisterhood of Heartbreakers is not a book that I would normally seek out. Based on the summary alone, the book appears to lean towards the contemporary world. And while there is nothing wrong with a contemporary book, they are not my all time favorites. But with the sparkle of possible paranormal elements, I thought I should give it a try. The Secret Sisterhood of Heartbreakers does not live up to its summary. In fact, I would almost say that the summary could have been for another book. In some cases this could have been a nightmare, but, for me, it was exactly what I needed. Lucy has been looking forward to her first day of sophomore year for what seems like months. Finally, she and Alex, her summer fling, will be able to go public. It is a day that Lucy has been dreaming about… except in this dream, she never could have imagined Alex dumping her on that first day back at school. But that is exactly what he does. But his actions do not go unnoticed. Oh no! In fact, it sets off a whole slew of events that Lucy and Alex never saw coming. Lucy, our MC, was a difficult character for me to like. From the first of the book, she gets my sympathy for having to watch as everything fall down around her. Her dream guy.. gone. What she thought would be a magical year.. gone. Everything that she had been waiting for.. gone.. because of a guy. Yuck! While her character pulled on my heart strings for a couple chapters, the sob story just kept going. After continuously hearing about this, I started to become annoyed. I wanted to yell at her: There is more to life than a guy! And Alex isn't even a guy that one should pine after. Ego the size of the Grand Canyon. Selfish. Just not a swoon worthy guy at all. The magical element is the book is not exactly paranormal nor is it really even supernatural. It something completely different. And I loved that. The book is also about growth. Learning to enjoy what you have. Not sweat over things you cannot control. And definitely not falling for guys that are no good for you. 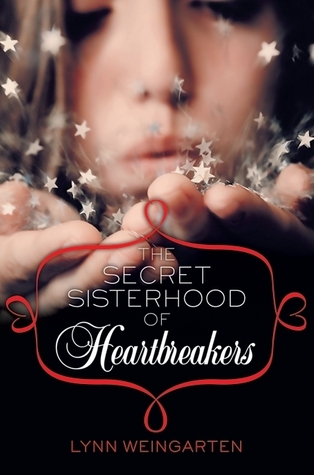 The Secret Sisterhood of Heartbreakers was a surprise. A nice surprise. A book that I am really glad I took a chance on. I love it when I go into a book that I have basically set up for failure, and it is nothing like what I thought it would be. The Secret Sisterhood of Heartbreakers, ultimately, left me with a smile on my face and feeling nice and fuzzy inside. I’m really intrigued about this book, especially the magic which sounds really different. NOt sure about the persistent protagonist but I’ll know what to expect now 🙂 Great review Kate!